You may not know this about me but I am an avid hockey fan. But not just any hockey fan. I LOVE THE OTTAWA SENATORS! Every year since they came back, I have treated Uncle Andrew to a local game and all the fixins for his birthday. That’s why I am so excited to be able to offer you the chance to win a family four pack of tickets to see a game! 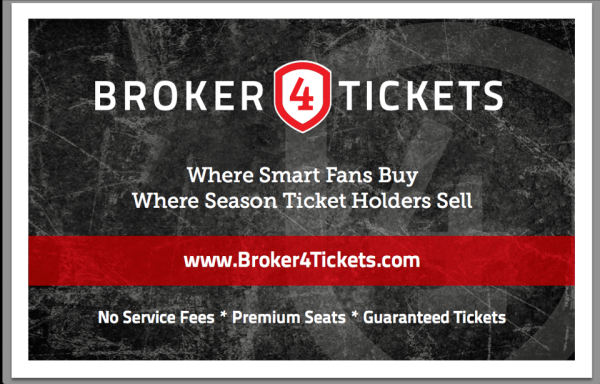 Broker4Tickets, located in Kanata (Ottawa), Ontario, Broker4Tickets “was started by sport enthusiasts tired of seeing season tickets go unused when there are fans willing to pay for these premium tickets”. Terrific News! Canadian Blog House has teamed up with some of my favourite fellow Canadian Bloggers to bring you a fantastic giveaway sponsored by the great folks at Broker4Tickets. My NBL Team (National Blogger Lineup) includes the fabulous Coffee With Julie, the amazing Ottawa Mommy Club, the wonderful Journeys Of The Zoo, the awesome Shannon’s View From Here, the fantastic Tales Of Mommyhood , AND the only man on the team, the irreplaceable Puzzling Posts Dad. WIN Ottawa Senators Tickets Below! Note that Journeys of The Zoo did NOT facilitate this giveaway. The giveaway associated with this post has ended. Check the Winners Page for details. I’d love to win please!!! I’ve never seen a game but would love to! Never been to a game! There is nothing like being a a live game! GO SENS GO! I’ve been to a few, but the best was my first ever playoff game this past April. Sens vs Habs, tickets bought from Broker4 Tickets. So much fun! I have never been to a hockey game at all. I’ve only been to the 67s when I was 6 which was long ago and because the tickets were free. I have been to a couple of games. The last one we went to was for my daughter’s 7th birthday (6 years ago). It was in Ottawa against Toronto, I’m sure you can guess who won. I havent. But I know my husband would love to go!!! I’ve never seen an NHL game live, but my brother LOVES the Senators and I’d be the best sister in the world if I won tickets for him. No I have never been to a LIVE NHL game. I have seen the Leafs in Toronto. No clue who they were playing against! Yes I have already been to one :). I went to 2 senators game, and a few Habs games when I was really young 🙂 I love it! Yes. Years ago. Montreal vs Detroit. I saw the Toronto Maple Leafs play in Maple Leaf Gardens, but I forget who they played. It was an amazing experience! I would be the BESTEST Auntie if I won this prize !!! I got to see a Toronto Maple Leaf game many years ago but I haven’t gotten to see the Sens play live yet. I’d love this. I watch NHL hockey all the time (GO LEAFS GO), but I have never seen a live game! So expensive I can’t afford it, but I would LOVE to go!!!!! Never been to a game before! I went to the Sens season opener this year. It was a blast! I love watching NHL games live. I’ve been to many games, however, the most memorable would have been Game 3 of the 2007 Stanley Cup Finals. want to experience a game in person! I have never been to a live NHL game but I would love to and I am sure my boyfriend would love me going with him! I have been to a couple Vancouver Canucks games and a few Winnipeg Jets games in the 80’s. but none in the last 13 years or so. nope I have not been to a game, but I send my kdis and grandkids when I can. I have never been to a live NHL game and looking forward to my first one! Would love to surprise my hubby and 10 year old daughter with tickets!!! I haven’t been to a game, but I would love to! I have been to a Senators game and many Leaf games as a kid. The last Senator’s game I was at was over 6 years ago. I would love to get another chance to see them play. My 5 year old son would love for me to win the tickets because he is huge Ottawa Senators fan. I actually saw my first game last year! The lastest game I’ve been to was the home opener vs the New Jersey Devils! It was pretty successful I would say! love to see the game..lots of friends alla round to come too. Never been to a game, but always really wanted to go!! I go to at least one game a year. It’d be great to see a Live NHL game! I have been to one NHL game to see the Sens. It was awesome! Sen vs NY Rangers 5th row. Best game ever!! I went to a Manitoba Moose game years ago with my daughter. Both my boys (6 and 9) are playing hockey and love it. They told me tonight that they would love to go to a NHL game (they have been to a Marlies AHL game). This would be a perfect!! Our son is 5 years old and is in his first year of hockey and is really excited to go see his first NHL hockey game. We would love to be able to take him out to see his first Sens game.